Have you ever lost track of time, the weeks were moving too fast and you realized your library books were overdue? I am sure we all have on occasion. Suppose you have four children and they all borrowed five books. Returning items just one week late would result in fines totaling $35. Many parents do not have extra money in their budget. Two things can happen. The family continues to visit the library but does not have access to all the services offered at their library. Often, the parent becomes frustrated and embarrassed about the fines and stops coming to the library. This is not a desired solution. “Food for Fines” begins May 1, 2018 and continues through the entire month of May. 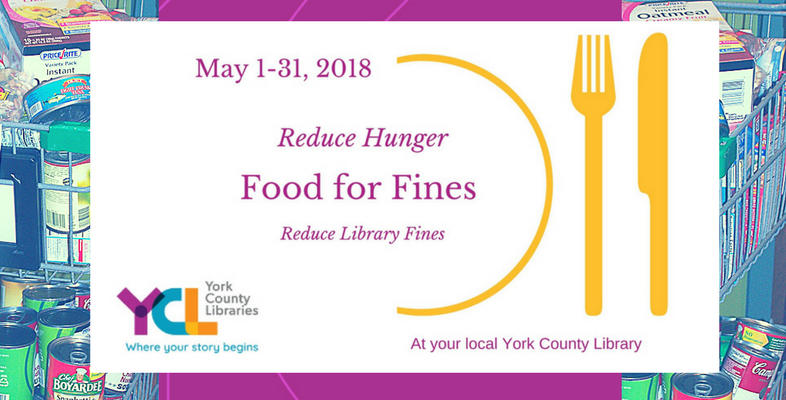 As a member of York County Libraries, you have the opportunity to reduce or remove your fines associated with overdue items. The “Food For Fines” program will allow all children to continue reading at home throughout the summer. Summer Quest is coming in June to all York County Libraries. Every child throughout York County can participate in the many free, fun, and educational opportunities provided by the libraries. Did you know that when children read and engage in these types of activities during the summer they return to school ready to learn? “Food For Fines” provides the opportunity for families to reduce their overdue fees by bringing nonperishable food items to their library. Each item donated reduces the fees by $1 and helps feed other families throughout the county. Donations go to food banks in the local community so that you are helping your neighbors feed their families. What if you don’t owe overdue fees? We invite you to pay it forward so other families and children have the opportunity to use the resources of the library this summer and throughout the year.